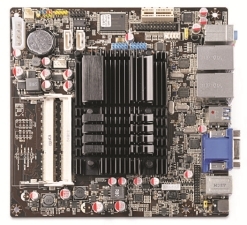 J&W’s MINIX line of mini-ITX motherboards have consistently targeted the higher end of the market with unique features and a focus on quality components. My first experience with their boards was the fantastic MINIX 780G-SP128MB, a mini-ITX gem that made its way into several HTPC and home server builds I assisted with. J&W looks set to continue the trend of quality craftsmanship with the release of the MINIX D2700-DC and MINIX D2500-DC. Both Cedar Trail-based boards will be passively cooled, include USB 3.0, and feature all-solid capacitor designs. J&W is also prepping a barebones kit based on the new boards. No word on pricing or specific release dates just yet, but evidently the D2700-DC is expected out first. Atom processors may not be as popular for HTPC builds as they once were, but J&W’s new boards may be worth a look for those interested in going low-powered and silent. Luckily, J&W spared no expense and both boards feature an all-solid capacitor design, with two USB 3.0 ports courtesy of a Renesas controllers and HDMI. They also feature 5.1 audio, VGA, Broadcom dual-gigabit LAN, one PCIe x1 slot and two DDR3 SO-DIMM sockets for up to 8GB of DDR3 1066, although Intel only recommends 4GB.